... 1057 (955 years ago today), on a battlefield about 25 miles away from Aberdeen, Scotland, King Macbeth was slain 17 years after he'd rebelled and killed the previous king, Duncan. This really happened. The killer on this day was Malcolm, Duncan's son. But the reason most of us know Macbeth's name is on account of William Shakespeare, who in 1611 or so wove the skeleton of this story into a masterful tragedy. 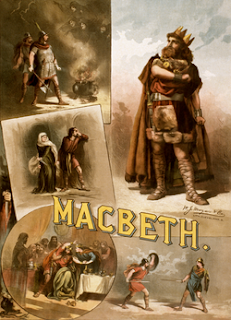 (credit for 1884 poster showing scenes from play) The characters include not only Macbeth, but also his scheming and ultimately remorseful wife, known only as Lady Macbeth. (And don't forget those 3 witches.) In the play, Macbeth's killer is not Malcolm but Macduff, yet another Scottish lord. The circumstance of Macduff's birth – by Caesarean section – forms an essential piece of the play's tragic puzzle.